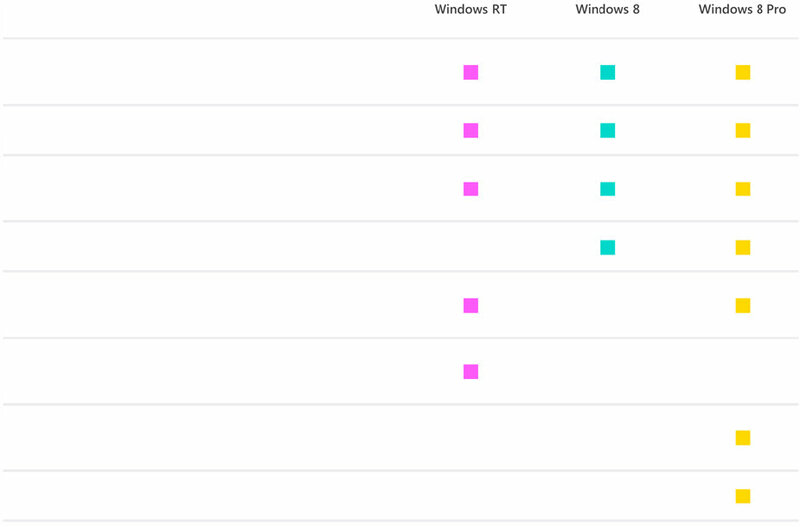 Which version of Windows 8 is right for you? If you want to install desktop software like Adobe Photoshop or an older version of Office, consider Windows 8 or Windows 8 Pro. Windows 8 Pro gives you all of the great benefits of Windows 8, as well as enhanced networking and data encryption features. Comes with Office Home & Student 2013 RT Preview preinstalled so you can do more out of the box. Use Windows to work and play with ease. Sleek and lightweight, with a focus on beautiful design and innovative materials, Windows-based PCs have reached new heights in performance and battery life. Entertainment and apps of every kind take center stage. Tap into your creative side, lose yourself in a game with friends, discover and download video and songs, and play them on your TV. The Windows Store is your place for getting apps for Windows 8 and Windows RT. Discover a variety of great apps, check out the featured apps, or tap or click a category name to browse all of the apps in the category. Windows is connected. Built-in mobile broadband features support 3G and 4G. As you move, your PC automatically finds and uses available Wi Fi hotspots. You can be effortlessly connected, ready to work, and able to stay in touch from virtually anywhere. The Start screen is the first thing you’ll see. Each tile on the Start screen is connected to a person, app, website, playlist, and everything else that’s important to you. This isn’t the usual wall of static icons. Instead, you see: status updates, weather forecasts, Tweets, and more. You see live updates before you ever open a single app. Pin as many tiles to Start as you want, and then group, arrange, and name them so it’s just the way you want it. Forget having to remember a bunch of letters and numbers to sign in to your PC. Now you can use a picture for your password. You choose the picture and the way you want to draw on it, so the possibilities are infinite—draw a circle around your favorite landscape, trace a pattern over your dog’s face—it’s easy. You can either draw a picture password directly on a touchscreen with your finger, or you can use a mouse to draw your shapes. Windows 8 and Windows RT come with apps for both the basics and a lot more. Apps like People, Mail, Photos, and Messaging power you through essential tasks and work together to make everything easier. Blazing fast with incredibly fast start-up times, longer battery life, and responsiveness you can feel in your fingers, Windows 8 PCs are humming with a new power. Bad things can happen to good PCs. From hackers, viruses, worms, spyware, and other types of malware, your PC has a lot to fight against. Windows 8 and Windows RT help to ensure that you’re protected at all times. Windows 8 and Windows RT transform the way you use your PC. They’re beautiful, fast, and fluid, with Windows productivity when you need it. Go ahead and push the limits. The features used most often by power users are now even more flexible and efficient. You can use the updated Task Manager to quickly see which apps and services are using resources on your PC. And if you want to see the nitty-gritty details of what your network connections and hardware are up to, or control the apps that run at startup, it’s all easy to find and control. Color-coded tiles help you to quickly see what’s going on. You can keep track of resources efficiently and immediately with graphs and details on processes, apps, and history. Whether you’re a person who puts all your files into a single folder or has dozens of folders and never throws anything away, you can use File Explorer (previously called Windows Explorer) to get a handle on your files. The new ribbon in File Explorer makes it a lot easier to do what you do most often, such as copy and paste files, show file extensions, and search for files based on date, type, or other properties. We’ve even brought back a long-lost favorite: the Up button. Windows 8 and Windows RT come with a number of options to restore your PC. You can even refresh your PC, which keeps all of your documents, accounts, personal settings, and Windows Store apps, but returns Windows to its original state. If you want to get more things done at once, consider using multiple monitors. Read a report on one while creating a presentation with another, or find apps in the Windows Store while you skim the latest reviews online. And some apps, like coding and video editing apps, are faster to work with when they’re spread across two or more monitors. Windows 8 and Windows RT have been designed to give you new, powerful, multi-monitor options. Use the four corners of each monitor to open the Start screen, charms, and your recent apps. Open desktop apps on all monitors, or open apps from the Windows Store on one and desktop apps on another. The flexibility of the new multi-monitor support will give you an edge in productivity. Windows 8 supports a wide range of devices, including printers, cameras, media players, and displays. They’re designed to just work when you plug in your device. A Windows Store device app is an app that lets you work with your hardware. For example, you can plug in a scanner and Windows will automatically download the associated Windows Store device app, when available. This app would allow you to preview, scan, and configure the scanner’s settings. Windows 8 generally works with the same peripheral devices and apps that work with Windows 7. With Windows 8 Pro, you get everything in Windows 8, plus enhanced features that help you easily connect to company networks, access files on the go, and more. Encrypt your data with BitLocker on Windows 8 PCs to help keep your work safe and confidential, even if your PC is lost or stolen. Windows 8 Pro also lets you connect to your company networks using domain join. For ultimate flexibility and data access, you can set up your work PC to allow remote connections and access it with Remote Desktop when you’re on the go. Family Safety is now an integrated part of Windows 8 and Windows RT, so it’s easier than ever to keep track of when and how your kids use your PC, and to set limits on exactly which websites, apps, and games they’re allowed to use. Family safety monitors your kids’ activities and lets you know what they’re doing. By connecting your account, you’ll even be able to get email reports right in your inbox. If you’re worried about your kids downloading apps, you can use Family Safety to control what they can download and see in the Windows Store. Set up a rating level to filter the apps according to your preferences. Want to learn more about Windows 8? See the latest info and start conversations with contacts from your email accounts, Facebook, LinkedIn, Messenger, Twitter, and more. See your photos and videos in one place, whether they’re on Facebook, Flickr, SkyDrive, or another PC. Send messages to a unified list of your Facebook and Messenger friends and choose from hundreds of emoticons. Browse your music collection, create and edit playlists, and keep up with the hottest new releases. See artist details with pictures, bios, and album lists. Sign up for Xbox Music Pass and get unlimited listening for millions of songs. Discover the hottest new games and download them to your PC. Depending on where you live and travel, you can edit your avatar, see what your friends are up to, and share your achievements with them. Stay informed. The beautiful, photo-rich News app, powered by Bing, makes it easy for you to stay up to date on what’s happening in the world. Keep track of your schedule in month, week, or two-day view. Get notified about appointments at the right time so you’re always on time. Use this app to check key market indices and stay on top of fast-changing market conditions right from the Start screen. View an interactive map with the Bing Maps app, and get turn-by-turn driving directions. Find traffic details, road conditions, street maps, Multimap, satellite photos, and aerial maps. Seamlessly access and work on your files from your Windows apps, as well as from your other devices. Get email from your accounts—including Outlook.com, Gmail, and Yahoo!—all in one place. See a beautiful preview of current weather conditions when using the Weather app. You’ll find the latest conditions and hourly, daily, and 10-day forecasts. Explore over 2,000 destinations all over the world through beautiful photos. The Travel app powered by Bing makes it possible: travel guides, booking tools, real-time currency conversion, and weather info provide everything you need to turn your next trip into an inspired adventure. Windows 8 and Windows RT include the Windows Store, where you can discover a new world of apps for your PC. Just tap or click the Store tile and start exploring. Filter apps by price, rating, and more. Many apps are free, and others let you try before you buy. So explore and load up on apps—the more you have, the more you can do. Sign in with your Microsoft account to any of your PCs running Windows 8 or Windows RT and immediately see everything that makes it yours: your background, your display, your settings. And when you get a new Windows-based PC, sign in with your Microsoft account and watch the People app come to life with info from your social networks. Windows: your stuff no matter where you are.